*This is book #18/35 for my 2015 book challenge. You can take a look at the reading challenge here. This was easily the best of the three Tiger Saga books I’ve read so far, and I’m finally more than just lukewarm about their entire situation. I am really pulling for them to win, and I’m really pulling for Ren and Kelsey’s relationship. This one had a lot more action, and I thought that the drama was far more gripping as well. I really liked the inclusion of dragon brothers, and I though Colleen did a wonderful job creating a unique realm that made sense in the world that she had already started building. Everything clicked together beautifully, and the mythology was wonderfully crafted as well. There were definitely some whining moments, and I really wish that Colleen didn’t push to make this is a love triangle. I think authors, especially authors of young adult books, think that they need a love triangle to interest their readers and I completely disagree. For me, it takes away from the story completely. If you’re going to do it – less is more. I care much more about the journey they’re on and the problem they need to solve than I do about a will-they-won’t-they relationship. Enough is enough, and it really irks me. Originally, it was news that Julie Plec (1/2 of the co-creators of The CW’s ‘Vampire Diaries‘) was the screenwriter of the Tiger’s Curse movie. I’ve loved pretty much everything she has ever worked on, and I wanted to get a head start by reading the books. So far, I am very glad I have, and I look forward to the movie’s release date (whenever that may be). Last I heard, which was back in November of 2014, they had just announced that Shekhar Kapur was to direct the movie. He directed Elizabeth, so I’m hopeful it’ll be good! 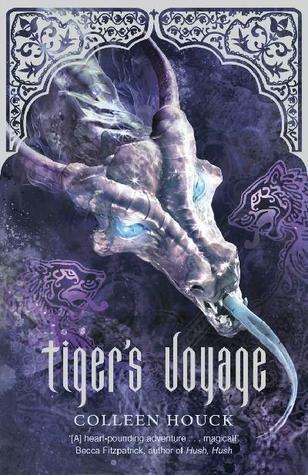 Other than the standard issues I’ve had with the series as a whole, I was really impressed with Tiger’s Voyage. The story has built up phenomenally to this point, and I’m super excited to start reading the final installment. ← Love the player AND the game! MTV’s ‘Are You The One’ is back!